Wide sandy beaches are the number one attraction here in Oceanside, San Diego. And while many beaches in California are swarming with people, Oceanside is the perfect place to go if you want to enjoy sun and sand without all of the crowds. If you’re a surfer looking to catch the perfect wave you’ll want to head over to Oceanside Harbor or “The Jetties”. And for those more novice surfers still learning the ways of the water, there is Buccaneer Beach. Just looking to enjoy the sand or go for a swim? That’s when you head to Oceanside City Beach. But regardless of what beach you choose, you can’t go wrong in Oceanside. We’ve already established that Oceanside has some of the best beaches in San Diego, but did we also mention that it also offers the most consistent surf conditions? If you are visiting Oceanside for the surfing, don’t forget to check out the Shaper District. Here you will have your pick from over a dozen surfboard manufacturers, many who allow you to design your own boards. The District is actually home to many well-known shapers like Donald Takayama, Michael Baron, and Gary Linden. And if surfing is your thing you might also want to check out the California Surf Museum which offers a variety of surfboard exhibits including surf art, equipment, videos, and memorabilia. Every year from December through April, stunning Grey whales pass through the waters of San Diego as they make their way to and from their breeding grounds. Each day eco-adventure tours leave from the Oceanside Harbor hoping to catch a glimpse of these magnificent creatures. Unfortunately, you probably won’t see too many whales from May to November, but tours still depart in search of other marine life like dolphins, sea lions, and pelagic birds. The Oceanside pier, located within the Oceanside Harbour, is a hotspot for fisherman looking to catch their next meal. But if you are looking to do something a little more adrenaline pumping, why not opt for a deep sea fishing tours? There are many half or full day fishing trips to choose from, and what you catch will vary from season to season. Having said that, April to November is the prime time to head out on the ocean. During this time there are plenty of sand bass, barracuda, sheephead, bonito, mackerel, and halibut to be found. Depending on the weather you could also catch yellowfin tuna, skipjack, and dorado. Once a week communities gather together in the Oceanside Sunset Market. The market is a family-friendly event that offers a large selection of merchandise, hot foods, and live entertainment. The market also hosts regular events throughout the year including author’s night and public safety night. It is a favorite among locals and tourists alike. 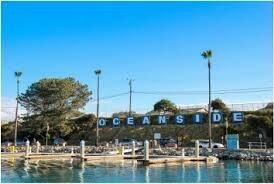 There’s no doubt about it, Oceanside CA is one of the best beach towns to live in, in all of San Diego. Each year it draws hundreds of thousands of visitors, not just for its beautiful beaches but also for its ideal surf conditions. And even if beaching and surfing aren’t your things, there are plenty of other on water and on land activities for the entire family to enjoy.